I had planned on being at the Apple store in the Westchester Mall when they opened at 10am today, but the kids needed me this morning so I was running late. I got to the store around 11am and there was a small line but it only took about 20 minutes to get in the door. What was lovely about the experience was I was sent into the store to meet with Dominick who was my personal shopper while in the store. He walked me to the counter to get my iPad, then over to the case collections to choose a case, and over to an on-display 17″ Mac Book Pro to input all of information for a business account. $906 later I walked out with two new apple stickers that happened to come with a 64GB iPad, Apple Care and a case. The In-Store experience was the best I have ever experience for an Apple launch. Kudos! It only took about 30 minutes to sync with my iTunes and really acted exactly like an iPhone on set up. I don’t have a ton of music and movies so it might be a slower setup for others. I also didn’t look to customize a lot of things upon set up as I usually like to try a devise in it’s intended form first. I did however change the home screen image (which you can’t do on the phone) and love it. The default home screen looks like it has scratches in it. So as soon as I got it set up and ready to play my 3year old woke up and said “Dora.” I then started to download the first season of Dora from the iTunes store and handed my new shiny iPad over to her in an effort to keep the peace. I was impressed with the sound output, much better then the speaker phone on the iPhone. 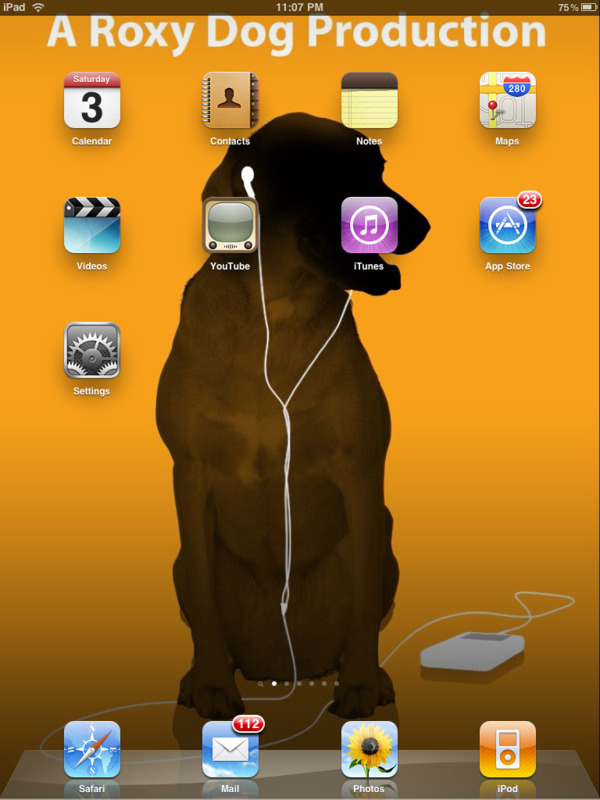 When I got it back I started to play with some of my iPhone apps that automatically loaded on it. Looks like all those developers are about to make another round of money to upgrade the apps for the iPad. They open up small and then you can 2x them, but then they are grainy. I just want to be able to buy each app only once and have it optimized automatically for each devise. I’ve downloaded a few iPad specific apps that I am about to play with, but I do wish that AIM was just installed and worked like it does on my machine. I LOVE the calendar. 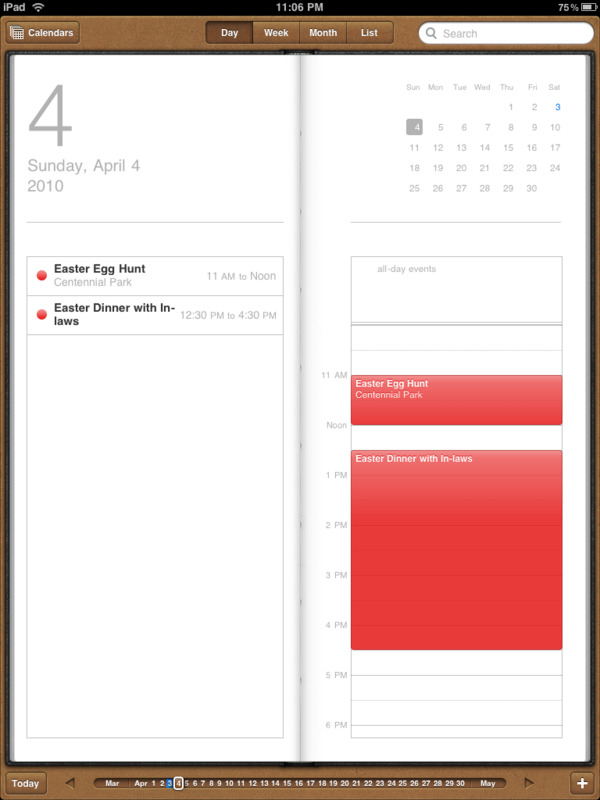 That layout should exist in iCal it’s such a great way to see it all. 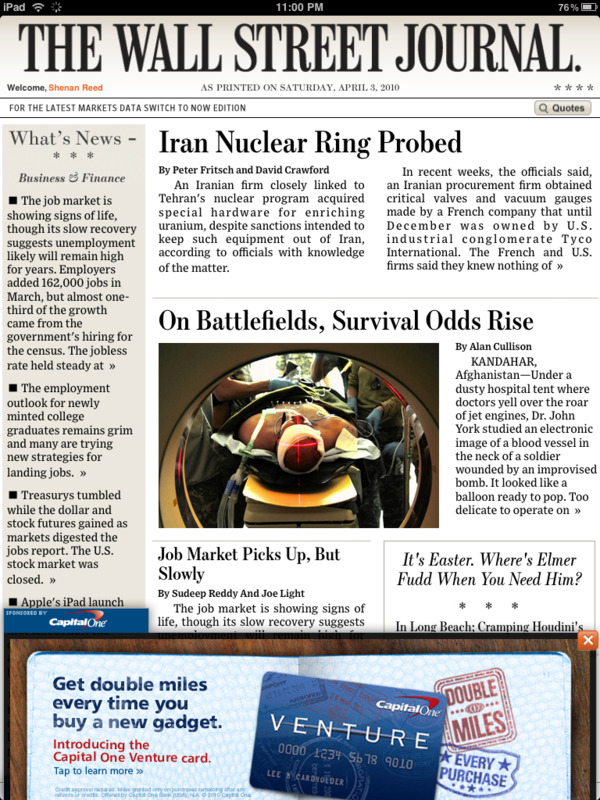 The WSJ app is great so far and has proven to me that this devise is an online advertising devise. Ad units click right through to the website. 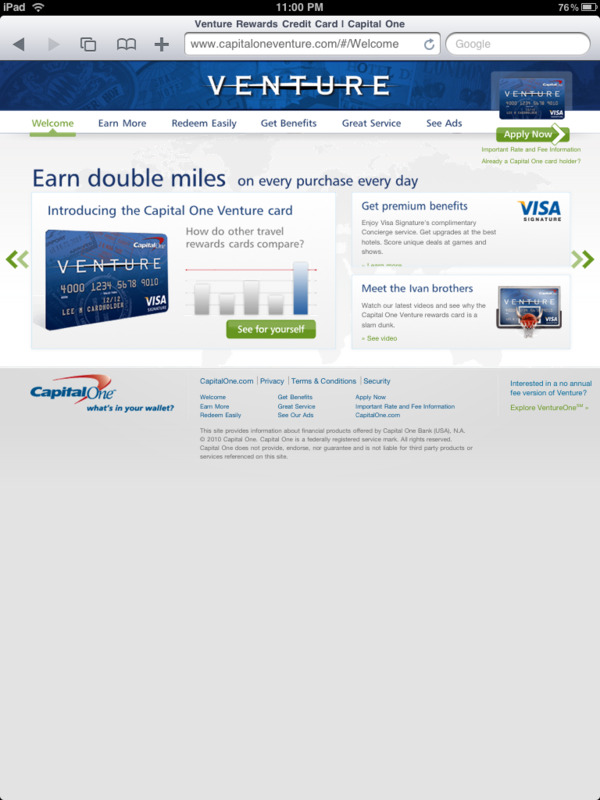 See the Capital One example. This is just a simple banner ad execution, that clicks through to the site. I’m looking forward to seeing some of the more rich media executions. I’m excited to play with the ABC app, the iPad stays a lot cooler then my laptop so it seems it will be a great devise for watching TV in bed. This is making me realize that media consumption is becoming even more personal and group media consumption (those days of watching Remington Steel as a family ) are gone. Stay tuned for more iPad thoughts and opinions as I play with the shiny new toy in my life. I have to say I was skeptical as to what i was going to use this thing for, but sitting here putting together this post while watching Family Guy in the background has been an absolute pleasure. Except in trying to finish this post I realized I will have to switch to my computer to plug in the images. Sigh – the trials of early adoption!